Krugman’s elementary error is that he fails to realize that market wages result from the interaction of both supply and demand for labor: If supply falls while demand remains constant (that is, if the supply schedule shifts to the left while the demand schedule remains unmoved), equilibrium wages will rise. However, if both schedules shift an equal distance to the left, the equilibrium wage will be unchanged, and if demand shifts by more than supply, equilibrium wages will actually fall. Economic news is either good, bad, or indifferent. The bad news about recessions is that they embody bad news. The demand for output, and therefore the derived demand for labor, unexpectedly shifts to the left in most sectors. Unfortunately, this means that the equilibrium wages required for full employment fall below expectations. Workers who are laid off in a booming economy can often find even better jobs than they left, resulting in a surprise increase in the average wage rate. But workers who are laid off in a recession ordinarily have to settle for a less attractive job than they had, resulting in an unexpected decline in the average wage rate. An extension of the duration of compensated unemployment effectively diverts part of the potential labor supply into prolonged unemployment. 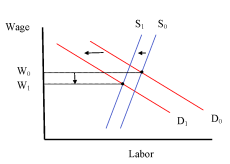 By itself, this reduction in the supply of labor would, as Krugman notes, increase equilibrium wages given a normal downward-sloping demand curve. However, if it comes at the same time as an even bigger decline in labor demand, the net result will be wages that fall, but not by as much as would have been required to maintain full employment. Krugman’s elementary error would make a good exam question for any Econ 101 class: Given a downward-sloping demand curve for labor and an upward-sloping or vertical supply curve, a leftward shift in the demand curve and a smaller leftward shift in the supply curve will cause the equilibrium wage to: a) rise, b) fall, c) remain constant, d) rise or fall depending on the actual slopes of the two curves. Unfortunately, Krugman gets this one wrong. In my earlier Beacon post, A Chance to End the Great Recession, I called attention to the very strong time-series correlation between the maximum duration of unemployment benefits and the average duration of unemployment. To be sure, the causality causing this correlation works both ways: High benefits cause higher unemployment, but at the same time, high unemployment causes higher benefits, either politically through ad hoc legislation, or automatically through state-wide “triggers” that typically must be met before the extensions take effect. As a result, it has been difficult to pin the disincentive effect down empirically, and studies have had mixed results. Nevertheless, the economic theory is quite clear. With the expiration of the federal subsidy to extended benefits expiring at the end of 2013, we can expect to see even further declines in the national unemployment rate over the coming months. J. Huston McCulloch is Professor Emeritus of Economics and Finance at the Ohio State University, and Adjunct Professor of Economics, New York University.